Did you know that Americans gobble up more than 16 billion (with a B) jelly beans on Easter? Well, now you do. 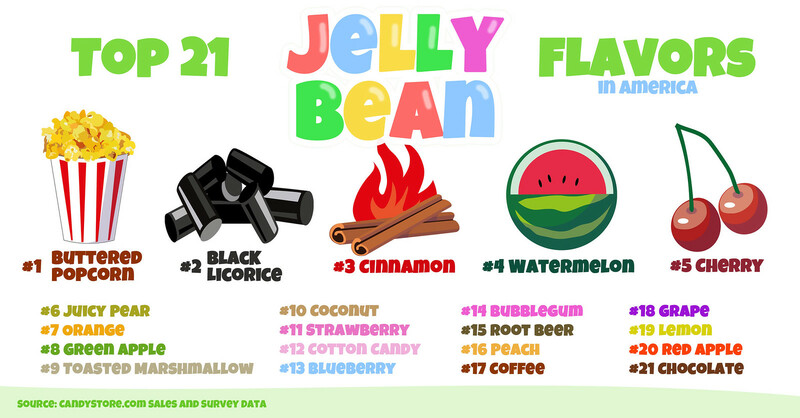 Since Easter is almost here, and National Jelly Bean Day is coming up on April 22nd, we got curious about which jelly bean flavors people love most. When we get curious, we dig through 10+ years of sales data. And then we survey a ton of people too. Cherry trees and cherry blossoms and cherry jelly beans. There is a lot of cherry lore happening in DC. Maybe that’s why the people of DC like cherry jelly beans the best. Black licorice came in second place. Could that be because of all the blackened-hearts of the politicians working there? Cinnamon was the #3 flavor, maybe that’s indicative of the spicy rhetoric flying around there. Or maybe it’s because these are all yummy and generally popular flavors? From Sapporo, not American, maybe I don’t understand.. How does anyone like black licorice? Watermelon, berry blue, cinnamon, marshmallow & tutti are the best, I think. good job. I was near your office in February. I m a travel writer.